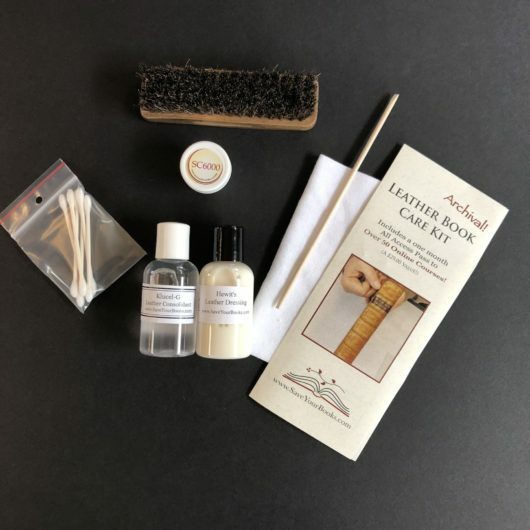 This book repair kit is designed to accomplish some of the most obvious book repair problems with archival solutions. The goal is to avoid damaging the value of your books. When you receive the kit there are instructions to get your one free month of Save Your Books membership. With the membership you get access to more in-depth videos showing how to do the repairs you want to do. 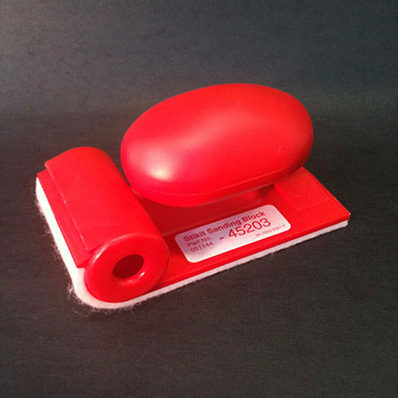 The code for the free month arrives with the kit so that you can activate it whenever you like. If you would like the code right away just let us know. 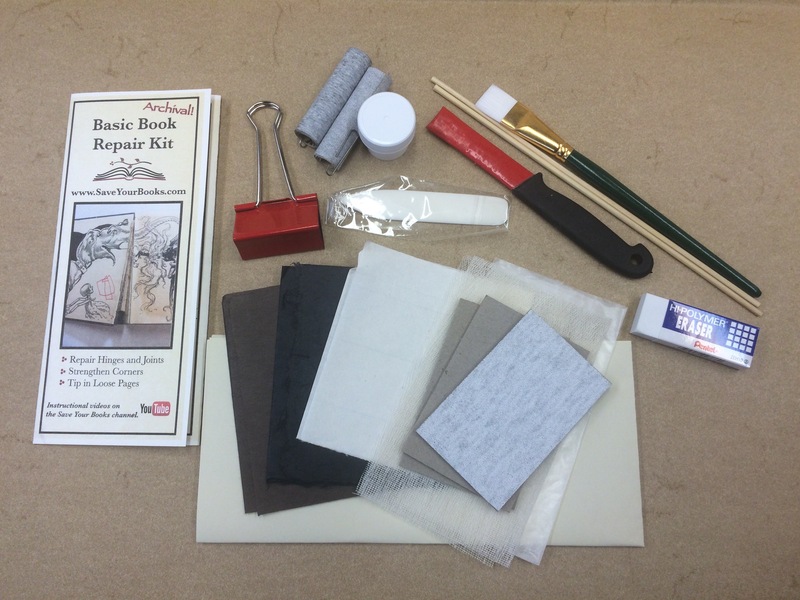 The Book Repair Kit comes with a one month All-Access Pass to the Save Your Books Courses! When you receive the kit there are instructions included to get your one free month All-Access Pass to the Save Your Books book repair courses. 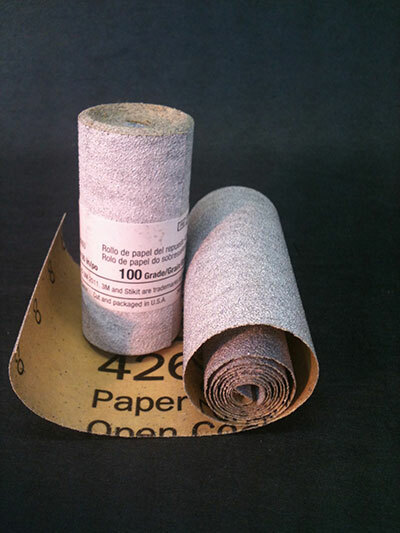 I designed the kit to accomplish some of the most obvious book repair problems with archival solutions. The goal is to avoid damaging the value of your books. 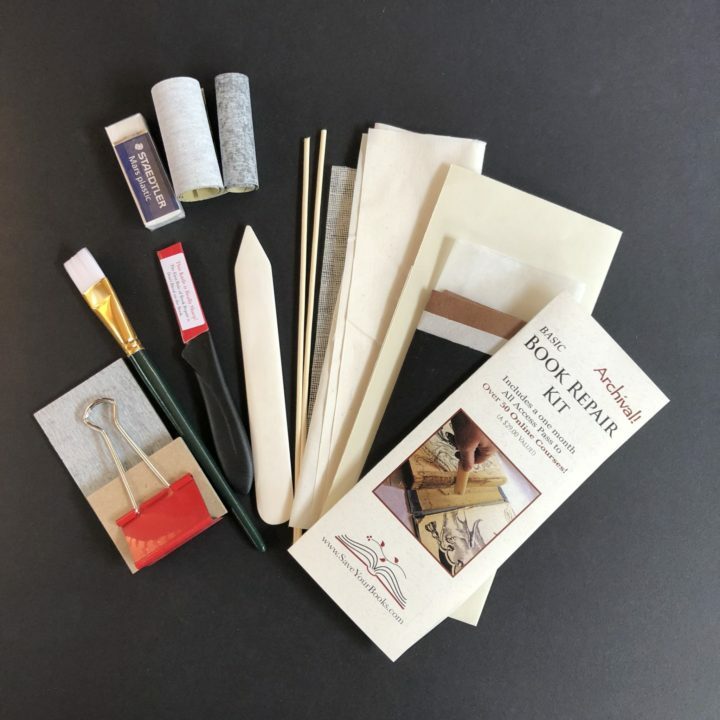 Book Repair Knife and simple sharpening board, 320 and 100 Grit Sandpaper, Brush for Glue (glue not included), Bone Folder, Binder clip, Corner pressing boards, Sekishu Tissue (white), Colored Japanese Papers: (Black and Brown), Wax Paper, Mull, Hinging rods, Muslin, Archival Dove Grey paper. Be sure to specify whether you would prefer a right or left-handed knife. Right-handed is the default. 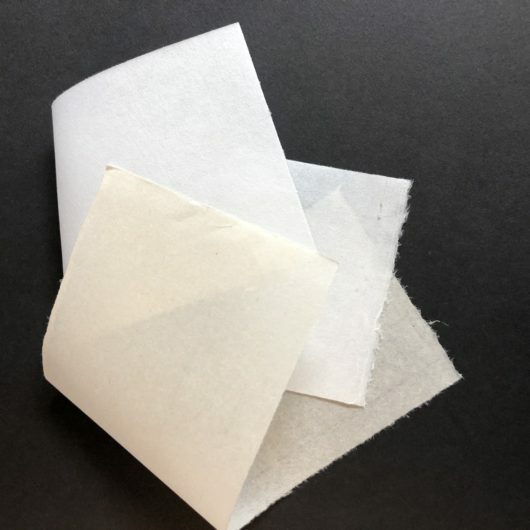 White Sekishu: Repair Hinges and Page Losses This 30 gsm weight tissue/paper is ideal to create new hinges, line text spines, repair losses in a page and much more….